The heroines of Korean history, who had been tipped to draw huge TV soap audiences this year, are struggling with present-day realities. SBS drama “Princess Jamyeong” only draws about 10 percent ratings and KBS’ “The Iron Empress” some 15 percent. One reason may be that they failed to win the hearts of middle-aged men, the bedrock of audiences for historical drama. Top actress Ko Hyung-jung surprised fans not only by appearing on a TV entertainment show for the first time in 15 years but also addressing rumors surrounding her shrouded personal life. While other networks are busy with dramas about young trendy teen stars and affairs between spouses and celebrities, KBS is beckoning fans with warm and comical stories of families. It is now evident that the world economic crisis has spread to all sectors including the entertainment industry. In Korea, celebrities have decided to take a pay cut in their talent fees as a sign of their willingness to help the industry. This is good news and a win-win solution for entertainment companies and actors. Companies can continue producing Korean dramas at a lesser budget while stars can expect work. It will be a hard blow if an entertainment company in Korea folds up. This will result in unemployment for actors, directors and staff and crew. The global economic crisis and corresponding local business sentiments are spreading over to the entertainment sector. Planned dramas are being dropped from production while top celebrities are willingly reducing their paychecks. Korean dramas are full of entertainment, with cliched yet dramatic plots, cute and handsome male characters, both main and supporting, and always a young pretty heroine. In almost all Korean dramas and movies, it is common to see characters drinking liquor in a green bottle. This is soju, the traditional alcohol of Koreans, which is made from rice, sweet potato and others. 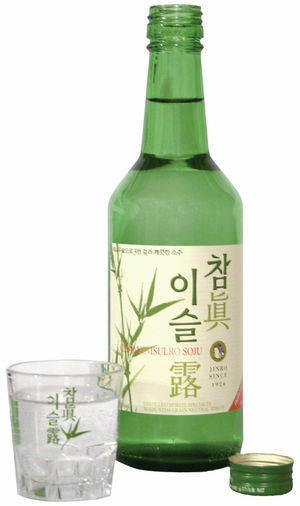 Koreans usually drink soju in its pure form, treating it like Coke. Curious about its taste, I bought two bottles of Jinro soju (about US$4.70 each) from a supermarket in Alabang. I told my friend Angy, also a fan of Korean dramas and music, to come over so I can share with her the soju. I no longer drink hard liquor but soju was different. It had a spicy and sweet taste and you can drink it unmixed. The best part of it was I didn’t have a dreaded hangover the following day.